My apologies for the extended leave of absence. I have been positively sick for the last couple of days and dragged myself to see another doctor just now. I’m still running a fever of 39.5 degrees, which while better than the previous day, is still making me thirst like nothing else. Thus, the good doctor put me on 1,000 mg of cephalexin per day. 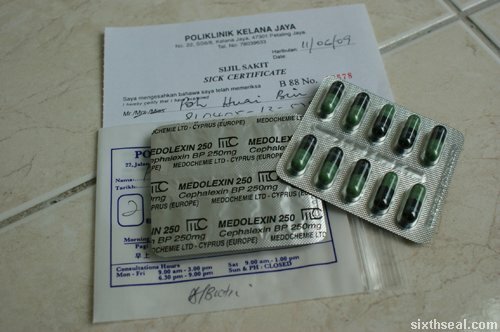 Doctors giving antibiotics for what is essentially a viral infection (influenza comes from a virus although the doctor thought it was dengue at first) always puzzles me. On another note, I’ve been having really weird fever dreams. I dreamt about…Sibu, of all things and the interesting thing is I always see it through rose tinted glasses. It’s like I (wonder of wonders) miss the place. That is pretty bizarre coz I never feel homesick. I’m not sure it’s homesickness per se, I hear you dream about your hometown when you’re really sick, it’s just one of those things. Okay, enough crap, the only reason I got myself out of bed is coz I miss writing. See ya on the flipside folks.